Two renowned world leaders have described “facts” in famous quotations that have bearing on the state of the Iowa Health Insurance Exchange. Starting October 1, 2013, Iowans will allow to buy health insurance, some at subsidized rates based on an individual or family annual income, as well as allow other Iowans to sign up for Medicaid on the Exchange, now referred to as the Marketplace. In Iowa, the Exchange or Marketplace is called a hybrid Exchange because both the Federal Government and State of Iowa are managing different aspects of it. The “stubborn” fact is that this Exchange should have been an independent Exchange, as in many other states including Colorado, Minnesota, and Connecticut, which were allowed to custom fit an enrollment process for the residents of that particular state. A state Exchange, in my mind, would have, one) created a more user-friendly process for Iowans to access health coverage, two) permitted changes in the process more easily as the need for changes become obvious, three) allowed Iowa to receive tens of millions of dollars to publicize the Exchange, and then easily access the Exchange, and most important, four) given Iowa more ownership in the health reform effort, which would have led to more emphasis on public awareness, education, and adoption. The Legislative Health Care Coverage Commission, which I led for two years, created detailed reports each year regarding the creation of an independent Iowa Exchange. A working group labored many hours creating recommendations, which the full Commission then approved. In addition, the State of Iowa received millions of federal dollars to investigate and prepare for health reform, including the creation of an Iowa Exchange. Yet, at the end of the day, we were told that Iowa, a leader in health care in many ways, would not create an independent Exchange and would sign on to a hybrid Exchange, abrogating our ability to customize the process for Iowans to a one-size-fits-all federal government approach. The Exchange will open October 1, and Iowans who sign up will receive health coverage through either health insurance or Medicaid beginning January 1, 2014. Yet, the “stubborn fact” is that an independent Iowa Exchange could have been much more and served Iowans so much better, under different circumstances. None the less, “facts are better than dreams” and we have the capability in our state to create a top notch system of health coverage for our residents. The pieces of the puzzle are on the board for us to put into place. We will have an operational Exchange (Marketplace) where individuals will access affordable options for health coverage. We will have options for health coverage both within the Exchange including CoOportunity Health, Coventry and others–the premium rates announced on September 20, 2013, are some of the lowest rates in the country–and outside the Exchange, from Wellmark, CoOportunity Health, and others. We already have an environment in which health professionals provide quality, efficient care and we already have a population who cares about their health and the health of their families, and will take efforts to improve it. The challenge is putting the pieces together. So let’s get to work. Our current topic is how to make the Exchange successful. Success will require motivated individuals to become informed individuals to maximize current services or create services that allow Iowa residents to fully utilize the Exchange starting October 1; the services to become widely known to the public; and finally, the public-at-large motivated to sign up for health coverage via the Exchange. This can be accomplished by personally accessing the Exchange on line, or with the help of currently available or newly created services. Steps 1 and 2 are self-explanatory but the other steps work through newly created positions. Navigators are employees of entities who have received federal grants to pay for this service. In Iowa, the three entities are Genesis Health System in eastern Iowa, Visiting Nurse Services, and Planned Parenthood. Each received grant monies to provide Navigators for certain Iowa counties. 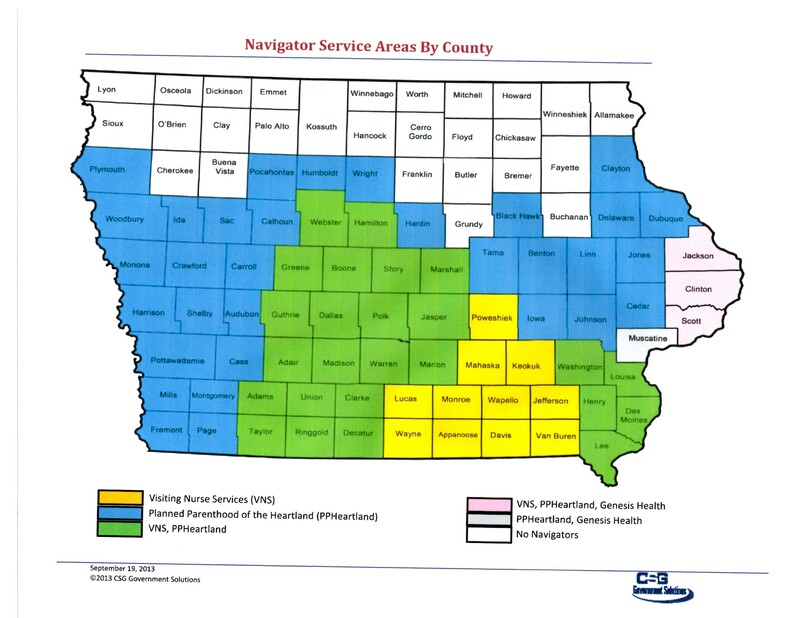 Unfortunately, 27 counties–more than one-quarter of Iowa counties–mostly in northern Iowa, have no access to Navigators. The white area on the map below indicates Iowa counties without Navigators. It is a significant portion of Iowa counties. CACs are volunteers from various entities including hospitals, physician groups, community health centers, and others, trained by the federal government to provide hands-on assistance to individuals signing up on the Exchange. At my clinic in Ames, my health coaches are CACs and will provide this service for clinic patients. A list of available Navigators and CACs per county will be available soon on a federal registry. From a pro-active stance, concerned individuals should know the resources available in their counties. Given that no further Navigators grants are currently available, the only way to increase capacity is to add to the list of CACs. I recommend communicating with local hospitals and physician groups to determine whether to congratulate them because they have CACs on staff, or ask them to apply for CAC status, and then train their staff members as CACs. Every qualified Iowan should have the knowledge and expertise available to them so they can access the Exchange successfully. 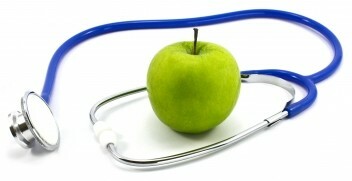 A key element of health reform for me has always been the success of an individual utilizing the Exchange. In my mind, health reform succeeds or fails based on the workings of the Exchange. I encourage everyone to access, promote, and help others to use the Exchange, starting October 1. Because the Iowa Exchange is a hybrid, residents cannot access the Exchange directly as they would in a state with an independent Exchange. They must first access the federal government website, http://www.healthcare.gov and follow the instructions on the screen. Health coverage information is also available by calling 1-800-318-2596. A future topic for me will be the “culture of coverage” which starts with successfully accessing the Exchange. I look forward to presenting ideas of how Iowa can promote a culture of health coverage across the state. One additional musing. I can envision successful Democratic state candidates using tactics such as a “Braley Bus” or a “Hatchmobile” with CACs on board visiting the 27 “orphan counties” in northern Iowa, helping individuals sign up on the Exchange and creating both name recognition for the candidates and good will in Iowa communities. I close with a return to the thought of “facts”. The Exchange represents the most tangible, identifiable, interactive element of the Accountable Care Act. Every week I see patients at greatly reduced or no cost because they have no health insurance and who are being denied health care options; every week I know there are patients of mine who should come see me for health concerns but do not because they lack health coverage. In hospice, I recently cared for a woman in her 50s with cervical cancer that was ravaging her body; without health insurance, she never received the preventive health care that should make dying from cervical cancer impossible in our society. Iowa’s Exchange could have been better, but even so, I believe it will improve and save lives by finally allowing thousands of Iowans–my patients included–to receive and benefit from previously unobtainable health care.